Tooth pitch is measure as the distance from tooth tip to tooth tip. As a rule there should be 3-6 teeth in the cut. As a blade is resharpened, the tooth pitch is reduced. Therefore, retoothing can be necessary occasionally. The blade speed depends on the material to be cut. For the standard construction steel it should be about 50 rpm when using a 11″ blade. Feed is measured as the chip thickness per tooth per revolution (max. 0.1 mm – .004″) but is generally listed as inches per minute. Using the correct feed, the chips are bright, even in size and nicely rounded. Plenty of fluid must be used when cutting. Mixture 6-10%. Resharpened blades always have to be “run in”. Make 6-8 cuts with normal speed and about 25% of normal feed. If “pick up” occurs, the blade should always be dismantled and retoothed. Thorough cleaning of the blade and flanges before mounting is very important and the backlash in the device pins taken out. This can be done by putting slight pressure against the face of the tooth in a direction opposite to that of the saw rotation as the blade is being clamped. When purchasing new blades, it is important to be aware of the blade material, bore tolerance, possible surface treatment and side run out. Circular saw blades should always be resharpened on machines that secure an even tooth pitch. Resharpening with coolant improves the blade life. Tooth geometry must be adjusted to the work piece. For example when cutting stainless and aluminum, special ground blades for these materials should be used. Number of teeth can also be listed as tooth pitch, which is the distance from tooth tip to tooth tip and is measured in millimeters.The tooth pitch used depends on the size and the material to be cut.In the table below the tooth pitch in mm is listed and in the table on the next page the number of teeth is listed. Main rule: 3-6 teeth in the cutThis rule is not used when cutting thin walled tubes, profiles, brass, copper and aluminum. For these number of teeth in the cut will generally be less and the cutting speed higher.In case of doubt or special tasks, contact Grand Blanc Industries at (800) 397-8511. The speed depends on the material to be cut and will be listed as either Surface Feet Per Minute (SFPM) or Revolutions Per Minute (RPM).Below is an example of RPM which is dependent of the blade diameter. A complete table with SFPM will follow on the next page. For high production cutting in solids on stable machines both the speed and the feed should be increased.For cutting tubes/profiles both the speed and the feed in the table for selection of speed and feed tube should be increased by 50-75%.For many machines revolutions are limited to two (high and low). Therefore, it is necessary to compromise and select the speed that best apply to the material. Large deviations will result in a shorter life and reduced cutting ability. Too low a speed is always better than too high a speed.If the deviations are too large, a frequency changer can be installed in order to get variable speeds. A frequency changer can be installed by most electricians. Chip load per tooth is independent of the speed. The correct feed can theoretically be calculated from a chip load of 0.004″(0.1mm) per tooth per revolution.In practice, the maximum feed is determined by the stability of the machine, the clamping and the capability of the motor.The chips are also an important factor determining the feed and they should always be the correct color and shape.Basic feeds listed in inches per minute can be found in the table on the previous tab. This is the basic feed and it can and should be increased by production cutting on stable machines or by using special blades. Proper chips are not formed, only “metal crumbs”. The blade is worn excessively and life is reduced. Discolored chips that weld in the gullets. There is great risk that the blade will break. The chips are nicely rounded, uniform and bright. Maximum use and benefit of the blade. Fluid is used for cooling, flushing away chips and lubrication.Use a recognized product and follow the suppliers instructions carefully. Sawing is a “hard” machining process that demands a mixture of 6-10%.Fluids should be applied in generous amounts on both sides of the blade during cutting. The nozzles must be pointed directly at the cutting point. The cutting process must never be commenced without fluids. If it is, the tooth tips will burn or “pick up” may occur, either of which reduces blade life substantially. Remember to clean both the blade and flanges well when mounting a blade. A single chip between the blade or flange can lead to excessive side run out as well as reduced machine stability and cutting quality. Always use “the run in procedure” for resharpened blades.Make 6-8 cuts with normal speed, but at only 25% of normal feed. Gradually increase the feed until normal feed is reached.The run in procedure hones the tooth tips removing the sharp fragile edges from the resharpening thus increasing blade life. Primarily used for non-ferrous cutting of thin walled profiles. Only ground on specific request from customers. Primarily used for non-ferrous cutting of thin walled profiles or cutting plastic materials and combination materials of plastic and aluminum. Rarely used unless a very high number of teeth are used. Used for non-ferrous cutting, plastic cutting or friction cutting. Form B is a stronger tooth than Form A and AW but is also primarily used for cutting thin sections. Primarily used for cutting work pieces in larger sizes. Ground as a standard tooth pitch T≥5 mm as a standard. Tooth form C is a triple chip tooth form with pre cutter tooth and is self-centering. Ground on tooth form B. The tooth pitch has to be T>3.8 mm (.15″) and the kerf 2.2 mm (.087″). Used for cutting all kinds of materials. The tooth form is only used for cutting thin-walled profiles with a wall thickness of 1.5-2.5mm (.059″-.098″). Chip breaker tooth form increases the blade life, lowers the cutting time and reduces burrs. Should only be used for production cutting on stable machines. Used on both tooth form BW and C (HZ). A stronger tooth that increases life time on more demanding applications. Tooth forms with altered tooth depths or angles can always be ground for special applications. Only ground on special request. The above tooth forms can be ground with specific angles for materials like stainless, aluminum, brass, copper and plastic.By using special types of grinding for non standard applications, a substantial improvment in cutting ability and life can be obtained. Please contact Grand Blanc Industries for more information, advice and benefit calculations. As a blade is resharpened several times, the tooth pitch is reduced. Therefore it can be necessary to occasionally retooth the blade in order to obtain the correct tooth pitch for the job.This is especially important for high production cutting of tubes.It is easiest done by letting your resharpening service retooth the blades when they reach a set minimum tooth pitch. Pick up will increase the thickness of the blade and result in the blade breaking. When pick up occurs, the machine must be stopped at once, the blade dismantled and retoothed. Pick up cannot be prevented by a special grinding of the blade and can only be removed by retoothing the blade.Grinding or other mechanical actions to the side of the blade will not solve the problem and it can easily make it worse. Brass is traditionally one of the materials, which demands that the speed and feed are correct. The speed and feed must be relatively high or heavy vibration occurs resulting in blade breakage.For cutting materials not mentioned in this guide, contact your supplier of tools or resharpening. The blade must as a minimum be manufactured in M2 quality steel. Need Help With Blade Selection? 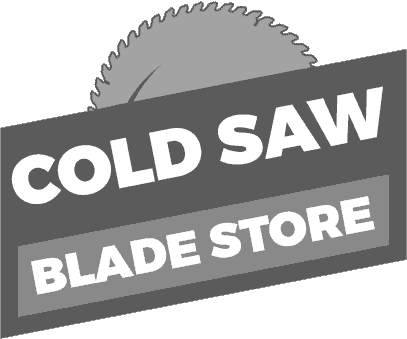 A cold saw blade specialist can answer any question you might have about materials, cutting and blades.